The basic resources are: Metals, Concrete, Rare Minerals, and Food. The advanced resources are: Polymers, Electronics, Machine parts, and Fuel. Then there the three life support resources: Power (electricity), Oxygen, and Water. A financial resource: Mission funds. And, finally, the 'waste' resource: Waste rock. We will now go ahead and talk about resources, how you get them, and some of the cost considerations tied to them. Let's discuss resources by their economy type. Personally, I classify the resources into two 'phases'. Drone economy, and Colonist economy. This is based on whether you can acquire and use the resource with drones, or with colonists, and whether they're useful with either. As such, we'll use this division for this guide. Concrete is used in maintenance costs, and in building costs. A lot of it will be required for building domes, as well as things like wind turbines, power accumulators, and the like. The resource extractor is automatic, and therefore is helpful to set up and leave running early when landing drones - thus, when you want to build your dome, you've got your concrete available fast. Late game, with the liquefaction technology, it is possible to convert waste rock into concrete, but this will take a long time. During the drone economy phase, Metal is acquired and gathered from surface deposits. It'll be very important to put up a sensor tower to find more, as many buildings (most importantly power cables and solar panels) require metal to maintain. There are two sources for water. Extractors - which are very useful early on, with one extractor being the equivalent of 4-5 Vaporators, and Vaporators - which can be used forever, making water one of the few infinitely available resources. However, in both cases, it's very important to remember that you don't get this water freely - you have to pay the maintenance costs. Naturally, it's essential to get a fuel economy up and running as rapidly as possible, specifically to allow you to make multiple rocket flights with a reasonably quick turnaround. Later, you'll need that fuel to make polymers. And power makes everything run. It's easy to think one should push for wind turbines easily - but keep in mind, wind turbines eat up machine parts. If you don't want to put the burden of resupplying by rocket onto yourself, your other option is to use solar panels - which will leave you unpowered during the night, but only cost metal in maintenance - or use accumulators, which will require polymers. Important factors for the drone economy are scalability and maintenance. The power supplied here is what will keep your rovers moving, and very early on, your sensor towers. It's possible to run the drone economy almost entirely on metal alone, making it very nearly self-sufficient until surface metal deposits run out. The primary goal of the drone economy is, fundamentally, to set up and support future colonising efforts. 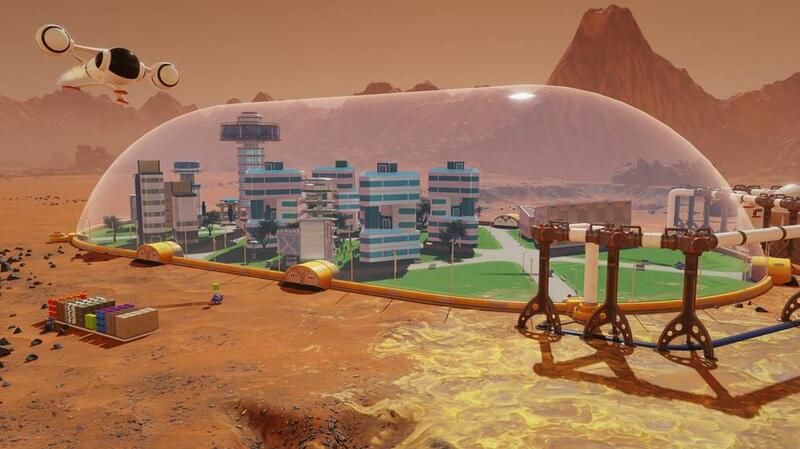 It is, in theory, possible to skip the drone economy almost entirely by dropping prefabs and the precise amount of resources you need to build a functioning colonist dome. And this may be a very worthwhile tactic to explore - though I haven't done much of it. It's also possible to land multiple rockets with rovers and drones to set up fuel and concrete factories in multiple places on the map, while scanning and exploring, delaying colonisation in favour of making sure you put your domes down exactly where you want them, then pulling the already-made concrete over. Explore your options! Oxygen is theoretically easy, but there are two tricky factors to consider. The first is that two things consume it - Colonists and Fungal farms, and the second is that without oxygen your colonists will die off much faster than without food or water. MOXIEs make two oxygen an hour, giving you a slight oversupply - always aim to have an oversupply and some spare oxygen tanks for each dome, so that during dust storms or if your MOXIEs freeze your dome doesn't die. Water comes back, but with two new concerns. It's now needed to supply your bases, and to supply the farms making your food. More is better. In the colonist phase, metal production becomes theoretically much higher, with manned extractors to mine for it. However, the amount of metal you'll be able to acquire will be much slower than during the drone phase. Surface deposits are quick to grab, mining, not so much. Thankfully, the main purpose for metal after you've built your dome will be maintenance. Most in-dome constructions require concrete and polymer, not metal. However, you will need some to convert into machine parts, too. Used to sell for mission funds, or to create electronics. Mission funding may make this an early priority for you, but in terms of maintenance costs, the only requirement here is in order to make electronics. Polymers are where things get interesting. Because all the components that create polymers are endlessly available - water into fuel, plus more water into polymers in a polymer factory - this is another infinitely available resource. And a very important one. In addition to building costs, it's required for maintaining structures like the Stirling Generator and power accumulators. This makes an early polymer economy, along with a metal mine, an option for a nearly self-sufficient colony early on... but more on this later. This is where things get trickier. I class these as basically two flavours of the same thing - a resource produced in factories from a single base resource. Many of your more interesting buildings will require a steady supply of one or the other of these - note that both factories for Electronics and Machine parts rely on Electronics for maintenance, making electronics a slightly higher priority. Colonists eat about .2 food a day, each. Or, an easier way to remember - 1 food feeds 1 colonist for 5 Sols. Remember this when looking at the potential output from farms. Also, this is why the fungal farm is good: it gives you meals daily. If you can get it to give you 5 food, that'll feed 10 people, without taking up ANY space inside a dome. No crop failures (that I've seen, anyway) so that's a guaranteed meal. Okay. Let's start putting all of this together. Right off the bat, there's two important concepts I want to suggest you think about. The first, is that all resources cost some other resource to acquire. No resource is free. Power from solar power panels costs metal. Water and oxygen out of the air cost what their extractors require in maintenance. Every single building with a maintenance cost is slowly and surely eating the maintenance resource to create the output resource. What am I going to spend tomorrow? Turbines look great - they make more power than a solar panel, and do it overnight. However, they cost machine parts, which you cannot produce locally until your colony is established and you've either purchased a prefab factory or researched the technology. Solar panels use metal - which is literally scattered around the landscape for you to pick up, at least for awhile. It goes on and on. And it's all so very easy to forget. Stirling generators are much, much simpler in these terms. They only require polymers to run - and polymers are a much more viable thing to produce early in the game. Only one manned building is involved, since there's no mining required, and the water/fuel cycle required to run them is likely something you already have for keeping your rockets flying. If necessary you can expand the same infrastructure for fuel by doubling the buildings (being careful not to overlap your vaporators) or simply halt rocket flights for awhile. Even if stirling engines cost mission funds early on, they're a much better option for self-sufficiency. What about food? Isn't it tempting to just ship in food, or use one of the nations that gives you a ton of food with each colonist? Each colonist seems to eat .2 food a day, if they aren't gluttons, meaning five colonists will eat 1 food each Sol. Thus, 100 food on a rocket will feed a colony of 100 colonists for 5 Sols. Not bad! Food's pretty cheap to buy and bring in, but that takes up a rocket flight - and you might not have them sitting spare and empty, you might be trying to use them to either bring in more colonists or more materials to do something else with. Food is the EASIEST resource to become self-sufficient in. Conversely, maybe you do want to ship food in - doing so opens up options to do different things with your colonists, like research. And this brings us to the second concept. Is this something I should be shipping resources from Earth for? I think there's a natural tendency to want to be self-sufficient from the start. It's how these games almost universally work, but it's not how Surviving Mars works. Other games, you put down a factory and it just makes resources and you have that set for life. In Surviving Mars, there is only ONE ultra-reliable way to do that. You build a dome, you research Martian patents, you buy the materials required to maintain your base and infrastructure with the money you get, and you bring in the rocket to keep it running. If you have any profits left over (you might not), you reach the state other games hand you for free. You reach the point where if you click, you know you'll profit out of it. Almost every resource in surviving Mars is limited. You profit only by consuming limited resources. Metal deposits will run out, as will water deposits - and getting water for free with a Vaporator will take awhile. There is exactly ONE way to get 'free' metal and rare metals (and waste rock), which is the Mohole Mine wonder way at the end of your tech tree. You MUST ship things from earth, and you MUST be wise about what that is. And almost certainly, you should be shipping materials with which to maintain your colony, not to build new domes or buildings on-planet. Thankfully there's an easy way to check what you're spending in maintenance costs by mousing over the resource window - consider, early on, shipping over rockets full of whatever that is and making yourself a nice stockpile to use while you figure out what to build. These costs seem TINY - often listed in the range of 0.1 or 0.5 units per Sol, though the accuracy on the mouseover seems variable - but you have to remember, you have to make your resources last from one rocket landing to the next. If you need materials from earth to build something, make sure you're only buying the materials you CANNOT acquire locally. In the long run it's much cheaper to drop a rocket with the drone economy required to make concrete locally than it is to ship the concrete in. It may be cheaper at the moment to ship in prefabbed polymers than it would be to try and set up a local supply. There's no hard rule here. No 'build order' like in an RTS. You have to use your judgement and remember both these issues - self-sustance and what you need to ship in from earth - when making your choices. I could cry at the number of times I've done just this. Vaporators need space between them, or they'll both drop productivity by .4... meaning that your two vaporators which were meant to be producing 2 water together, are now producing 1.2 water. Ouch. If you don't need a building, and you won't for a long time, it's worth switching the building off entirely. Even if it's a power producing building. Some buildings degrade whether or not they're running, some degrade more slowly or not at all. Also there's that pesky martian dust around extractors (even water extractors) to contend with. But the point is... if you're not using a building, why are you paying the maintenance cost to keep it running? If you want it later, it'll still be there. And if you don't want it, you can, of course scrap it entirely. If you run out of water during a dust storm, chances are good your crops will die. If you're running razor thin on food (which is likely early on), you might be all 'yes! I saved my colonists!' when you get the water back on, only to discover later on down the line that you're about to have them all starve... Build a bunch of sensor towers. You can get 3 Sols worth of warning, or more, about disasters. Water tanks, power accumulators, and oxygen tanks are all your friends. They will take a situation that could kill, and turn it into just an unpleasantly windy day. In an emergency, you can scrap your rockets. You get (IIRC) Metal and electronics, which might save your hide in a pinch. The only shop that doesn't consume these resources is the grocery. Building an early electronics shop, or similar, could well result in a MAJOR resource shortage early on. Careful with that. Don't try and build fancy resource-sharing networks! Well, try if you're sure you want to try, but... a group of linked Drone Hubs, with universal resource dumps, will, yes, share your resources from one building to another. But it'll also mean you have one machine part sitting in a supply dump halfway across the map from your wind turbines that need to be repaired. Surviving Mars - Long Spidery Power Cables and Pipes? Too Much Maintenance?